The Chantelles (Riss Chantelle - Sandra Orr - Jay Adams) blended together to make one of the best vocal harmony sounds England has produced, this is possibly the only way one could begin to describe them. They made their record debut with "I Want That Boy" and it was an instant success for them. 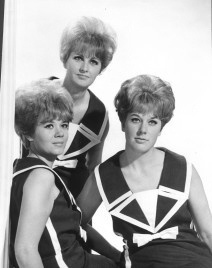 On the strength of this success, The Chantelles were invited to appear in the film "Dateline Diamonds" together with Kiki Dee and The Small Faces, which was filmed around the Radio London ship, where "I Want That Boy" topped the charts. Next came a television series with Jimmy Logan, and TV appearances with Acker Bilk. With their fast moving and exciting act, they played some of the leading venues throughout Europe, making numerous television appearances en route singing soul, gospel and pop. The Chantelles also appeared with many stars in concert including tours with Tom Jones, Englebert Humperdinck, The Beatles and many more. Later, singer & songwriter Nola York joined the girls and recorded and toured with the group. When The Chantelles disbanded, Riss Chantelle formed Chantelle Music, and managed Nola York, who carried on with her career writing songs and musicals. These included "Lady Or The Tiger" and "Wild Wild Women" which both played the West End.